The mission of this residency program is to provide excellent optometric clinical training and education with a focus on delivering compassionate primary and secondary eye care services to middle-aged and geriatric veterans in an outpatient clinic-based environment. Outcome: The resident will provide primary eye care services involving a minimum of 1000 patient encounters, 60% of which will include obtaining a case history, visual acuity, refraction, tonometry, and external and internal ocular health assessment during the encounter. Objective 1: The resident will perform the appropriate diagnostic procedures. Objective 1: The resident will review and utilize ophthalmic fluorescein angiography to guide treatment and management. Outcome: The resident will review 25 or more angiographic procedures (ophthalmic fluorescein and/or indocyanine green angiography) during the residency. Objective 2: The resident will develop expertise in ordering and interpreting relevant laboratory and radiological procedures. Outcome: The resident will order and/or interpret laboratory or radiological procedures on at least 25 patients during the residency. Objective 3:The resident will develop expertise in interpreting posterior segment imaging techniques ( OCT). Outcome: The resident will perform OCT testing and interpret the results on at least 50 patients during the residency. Objective 4:The resident will develop expertise in interpreting ophthalmic photography and use it to guide decision making in the treatment and management of patients. Outcome: The resident will interpret ophthalmic photography on at least 50 patients. Outcome: The resident will coordinate care with non-optometric providers in management of patients with systemic disease. The resident will participate in relevant presentations and conferences on systemic disease. When possible, the resident will also present and submit posters or lectures to a national optometric meeting, such as the American Academy of Optometry and SECO. Measure: The resident will report monthly on participation in conferences of this type using the patient encounter logs and summary sheets. Goal 5: Enhance the resident’s knowledge of low vision care. Objective: The resident will gain experience in managing patients with limited sight. Outcome: The resident will evaluate and manage at least 25 patients with limited sight. Outcome: The resident will present lectures during conferences and other meetings held at Southern College of Optometry, the Greenville Outpatient Clinic, and the Dorn VAMC. When possible, the resident will also present posters or lectures in other settings such as the American Academy of Optometry and SECO. Learning Activity: The resident will provide primary eye care services involving a minimum of 1500 patient encounters, 60% of which will include obtaining a case history, visual acuity, refraction, tonometry, and external and internal ocular health assessment during the encounter. Learning Activity: The resident will perform and/or interpret ophthalmic fluorescein angiography, fundus photography, B-scan ultrasonography, anterior segment photography and relevant laboratory and radiological procedures. 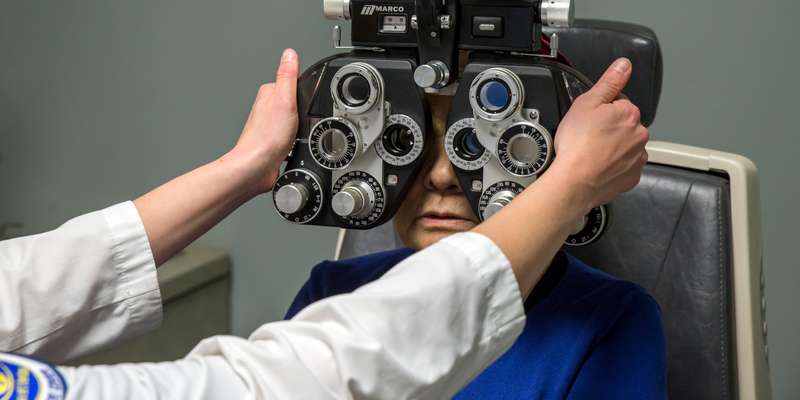 Learning Activity: The resident will present lectures during conferences and other meetings held at Southern College of Optometry, the Greenville Outpatient Clinic, and the Dorn VAMC. When possible, the resident will also present posters or lectures in other settings such as the American Academy of Optometry and SECO. A. The residents are defined as employees of the Greenville VAMC and the residency stipend is paid by the VAMC. No tuition or fees are applicable. B. Applicant must pass all parts of the National Board of Examiners in Optometry examinations required for license and furnish official transcripts when available. C. Professional liability protection for residents for professional activity performed at the Greenville VAMC. D. Residents will be required to present credentials according to the Greenville VAMC policy for credentialing of residents. F. Residents privileges will be determined by Greenville VA policy. All residents are eligible for sick and annual leave. A. The resident is required to deliver clinical services at a level which is satisfactory to the Residency Supervisor, Director of Residency Programs, and the SCO and Greenville VAMC administrations. Typical Weekly Hours and After-Hours Responsibilities: Minimum of 40 hours per week will be required. The resident will provide emergency eye care services during regular clinic hours. E. The resident is expected to perform in a professional manner in the delivery of patient care services and to observe those proprieties of conduct and courtesies that are consistent with the rules and regulations governing Greenville VAMC. H. Any resident accepted for training can be dismissed, without receiving a certificate of completion, for infractions of the rules and regulations of the Greenville VAMC or those set forth by Southern College of Optometry, or for any action which jeopardizes the safety of patients, personnel, or physical facilities. The current stipend is $34,888. Compensation is not contingent upon productivity of the resident. Other employment (moonlighting) is permissible during the residency year provided it does NOT interfere with the primary responsibility of veteran care. Also, the VA malpractice insurance does NOT cover work performed outside the VA facility to non-veterans. The residency program at Greenville VAMC is fully accredited by the ACOE, 243 N. Lindbergh Blvd., St. Louis, MO 63141, 314-991-4100. The resident reports to the Supervisor of the residency program. The Supervisor reports directly to the SCO Director of Residency Programs who in turn reports directly to the Vice President of Academic Affairs at Southern College of Optometry.